This Chapter is a modified reprint of the Design Report of LUPMIS with additional remarks for the War Office in Chapter A2.2.4. 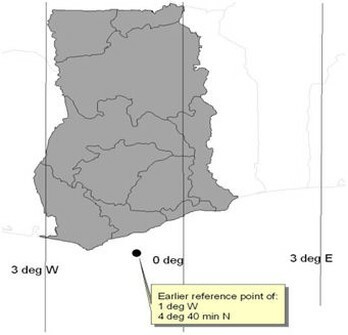 There are various projections and datum definitions, which are or have been applied in Ghana and result in some confusion and inaccuracy of mapping and surveys. (Technical definition: A datum is a set of reference points on the earth's surface against which position measurements are made, and (often) an associated model of the shape of the earth (ellipsoid) to define a geographic coordinate system. Horizontal datums are used for describing a point on the earth's surface, in latitude and longitude or another coordinate system. Vertical datums measure elevations or depths'. A datum is defined by the ellipsoid and the shift of the x,y,z origin). One of the first datum was the Accra Datum 1929 used for the ellipsoid of War Office 1926 (also McCaw 1924), which can still be found on recent maps (e.g. on some 1:2,500 topo). Earlier maps had imperial units (‘Gold Coast feet’, not UK feet, equals 0.3047997 m), recent maps have metric units. The War Office projection (rectangular polyconic projection) has been defined 1853 and was mainly used in the late 19 century. In 1977 the datum was changed to Leigon Datum 1977 used for the ellipsoid of Clarke 1880 (modified). This system is shown on some current maps (e.g. on some 1:50,000 topo), all with metric units. 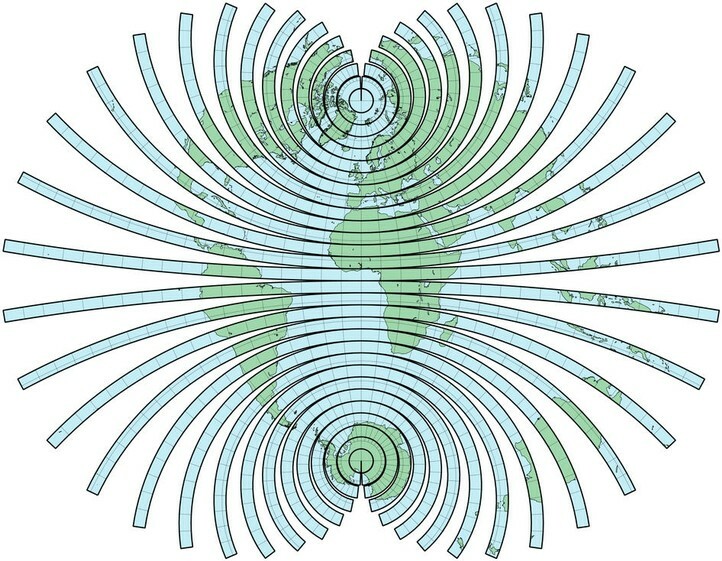 1 - The geoid is the precise shape of the earth, which is hardly defined in geodetic, mathematical terms, and therefore not be used in GIS systems. 2- The ellipsoid is the best mathematical definition to the shape of the earth. In most cases, the major and minor semi-axes of the earth are used. 3 - The datum is a more precise definition of the model of the earth. 4 - The projection is the conversion from the 3-dimensional earth to a 2-dimensional, flat surface of a map, and includes the projection method, the point of origin and a scale factor None of the many projections is complete; every one has specific advantages and disadvantages. The problem of having different datums was not recognized as a major problem in the past, because most GIS applications have been applied on small or medium scales, where errors due to different datums of upto 100-500 m do not show. Agencies (LSAs) or institutes have different requirements for the tolerance of acceptable error, depending on the operating scale, either larger or smaller scales. At the NLIS, with mapping and inventories of parcels and cadastres, higher accuracy than the beforementioned of 100-500 m is required, together with high compatibility. For map data at LUPMIS, a maximum error of 5 m can be accepted, which is derived from a compromise between cost efficiency and financial sustainability, projection and datum definitions, (handheld) GPS accuracy (DOP), map reading skills of surveyors, i.e. at the maximum scale of 1:2,500, and the accuracy to be expected for the tasks of TCPD. To be precise at that accuracy level, consistent within the NLIS, and technologically applicable, the Consultant strongly recommends to update and use a national grid (including projection and datum) as fast as possible for all mapping activities in Ghana, to be used with all GPS and on all GIS software, which is also easy to use, well documented and in accordance with international standards. WGS84 is the most commonly used contemporary datum, based on highly accurate and most recent measurement of the shape of the earth. WGS84 is the default standard datum for coordinates stored in all commercial GPS units. It is also incorporated in all GIS software. This will enable the professional and easy use of GPS and GIS. 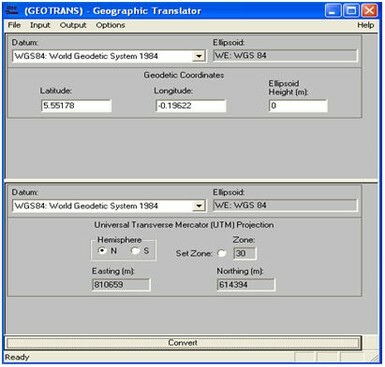 Many GPS do not enable the collection of data on other systems than the WGS 84. The same system can also be applied by LIS (LAP) and all LSAs. Differences of point coordinates measured by different datums and projections can amount to the range of seconds, i.e. 300 m or more, well beyond the accuracy of GPS. The UTM system is the highest standard of projection applied worldwide, with a high level, well-defined accuracy (below 1 part in 1,000). It is easy to handle in the field due to its units of meters. Most, if not all of the neighbouring countries of Ghana use the UTM system. Introducing and implementing the UTM projection is therefore also in accordance with the other countries of the region. The use of UTM is also in fulfillment of the Africa Reference Framework (AFREF) initiative in Ghana and Africa in general. Recently, the GTM (Ghana Transverse Mercator projection) has been promoted by the Survey & Mapping Division of the Lands Commission, Ghana. The publication of the parameters will be experted soon. 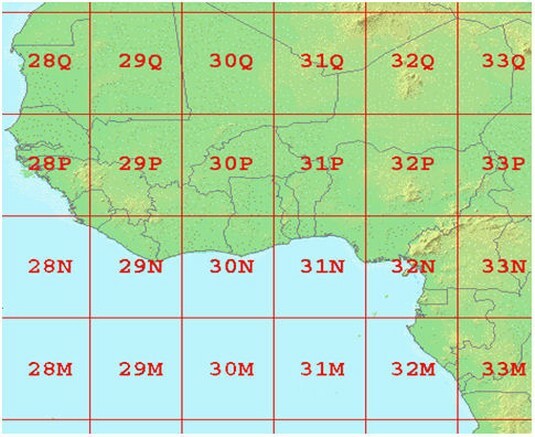 In Ghana, UTM zone 30 applies (see figure below). Beside these many advantages of applying such a precise, most up-to-date system, the only disadvantage might be a slightly higher error in the extreme East of the country, if zone 30 is applied on a national scale. On large scale, maps can easily be transferred to UTM zone 31 in these few areas in the extreme East to resolve this problem. At TCPD, the Consultant recommends the UTM projection based on WGS 84, in order to apply a modern, adequate system, which is accurate, has not to be changed within a few years and which can easily be used by surveyors and planners in the field with GPSs. Because maps in War Office projections are stilll widely used in Ghana, the concept of War Office will be explained here shortly. War Office projection was referred to first time in 1853, is was then used mainly by the British Army. Latest applications with some modifications were made in Senegal 1924, in the U.S. by the US Geological Survey in the 1930s, and for mapping of northern Canada in the 1980s. It was a modification of Hassler's projection, therefore often (but not in Ghana) based on Hassler's ellipsoid. - Parallels are circular arcs, equally spaced along the straight central meridian. - However, scale of the parallels is not constant, changing in order to make each meridian cross every parallel at right angles. - This is not a sufficient condition for conformality, neither is the result equivalent. Besides, only the equator (at the general rectangular polyconic projection) or the parallel at 4.66666 deg N (at the War Office projection in Ghana) has a true length. 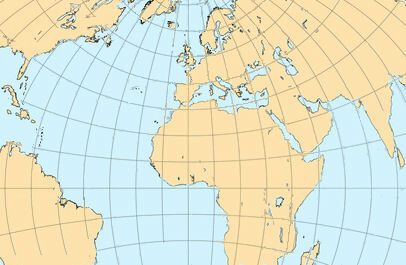 - Meridians: Central meridian (in Ghana at 1 deg W) is a straight line. All other meridians are complex curves, equally spaced along the Equator (at the general rectangular polyconic projection) or the parallel at 4.66666 deg N (at the War Office projection in Ghana) or along two chosen parallels symmetrical about the Equator. Meridians intersect all parallels at right angles. The projection for the War Office in Ghana is based on the Accra datum. 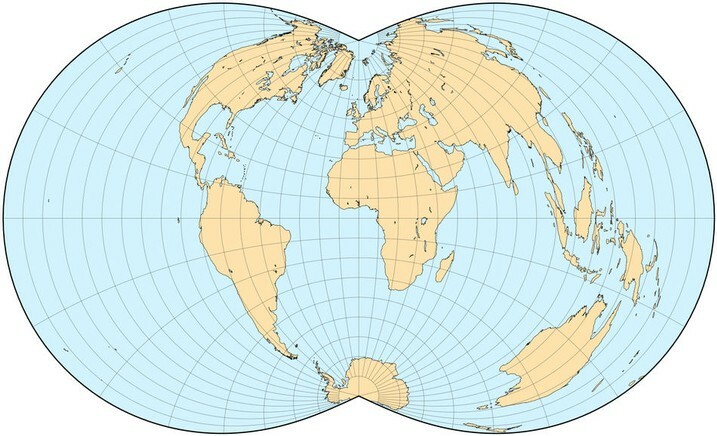 A polyconic projection is a map projection consisting of a composite series of concentric cones each of which before being unrolled has been placed over a sphere so as to be tangent to a different parallel of latitude (as shown below in the generalized chart). With this sheet-based projection (multiple cones), transformation parameters have to be defined for each individual sheet, which is a lengthy process. (Not like any Transverse Mercator projection (or any other cylindrical projection), such as UTM or GTM, where transformation parameters are fixed for the entire zone). Currently, there is research work ongoing, to define all parameters for a computational calculation to convert from War Office. Similar formulas for computerized processing for UTM are applied for a long time, and can be supplied by TCPD-HQ on request. 1) Based on feet: Point of origin is 900000 / 0 feet at 1 deg W / 4.6666666 N (in the ocean, SW of Accra). 2) Based on meters: Point of origin is the same, but expressed in meters: 274320 / 0 m. There are rumors, that the Japanese, when they introduced the metric system to the War Office projection, did not use the correct meter-feet conversion, but a slightly rounded one. Example: Maps in Accra have an easting of around 300,000. The coordination conversion package Geographic Transformer to convert to / from different projections and datums is highly recommended for the ease of its use. This software has been ‘fudged’ (i.e. adjusted based on empirical error minimization), but research still takes place (as of October 2007) to adjust the conversion to / from War Office definition in precise, geodetic terms. Alternatively, different conversion software with predefined War Office conversion has to be searched for, and procured, to enable - at least in the interim period - a conversion from collected GPS coordinates to the War Office system to be done with the expected accuracy. 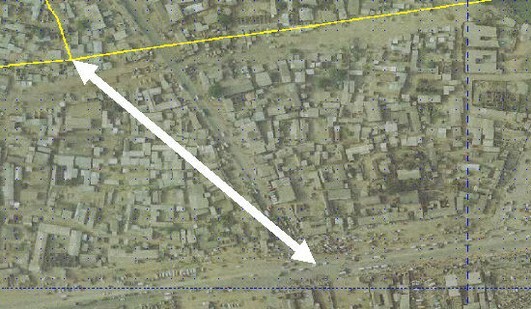 the yellow line in the upper part of the photo is the track of the road with GPS / WGS 84 (in lat/long). Currently available projections parameters are listed in Annex 8. 'GIS Introduction for LUPMIS: Coordinate System (Chapter 7)'.